Saturday Knight Jocelyn Shower Curtain Hooks, 12 Piece by Saturday Knight at Walk In Tub Showers. MPN: P1067600360004. Hurry! Limited time offer. Offer valid only while supplies last. The Jocelyn shower curtain hooks harmonize with the shower curtain and the Jocelyn collection brining a sense of Calm and tranquility to your bath. The Jocelyn shower curtain hooks harmonize with the shower curtain and the Jocelyn collection brining a sense of Calm and tranquility to your bath. 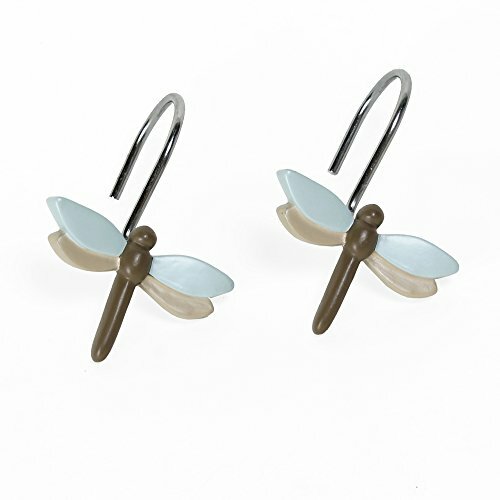 Hand painted blue, taupe and brown dragonflies take wing across your bath.